Law and neuroscience seem strange bedfellows. But the engagement of law with neuroscientific evidence was inevitable. For one thing, the effectiveness of legal systems in regulating behavior and meting out justice often depends on weighing evidence about how and why a person behaved as he or she did. And these are things that neuroscience can sometimes illuminate. For another, lawyers are ethically bound to champion their clients’ interests. So they remain alert for new, relevant, or potentially persuasive information, such as neuroscience may at times offer, that could help to explain or contextualize behavior of their clients. In light of this, and in the wake of remarkable growth in and visibility of neuroscientific research, a distinct field of Law & Neuroscience (sometimes called “neurolaw”) has emerged in barely a decade. Whether this engagement is ultimately more for better or for worse (there will be both) will depend in large measure on the effectiveness of transdisciplinary partnerships between neuroscientists and legal scholars. How can they best help the legal system to understand both the promise and the perils of using neuroscientific evidence in legal proceedings? And how can they help legal decision-makers draw only legally and scientifically sound inferences about the relationships between particular neuroscientific evidence and particular behaviors? In this article, we highlight some efforts to establish and expand such partnerships. We identify some of the key reasons why neuroscience may be useful to law, providing examples along the way. In doing so, we hope to further stimulate interdisciplinary communication and collaborative research in this area. As the incidence of cognitive impairment increases with advancing age, a larger number of our elderly population will suffer some variety of dementing disorder. 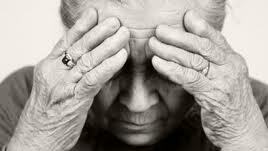 Causes include Alzheimer’s disease, multi-infarct dementia, and a variety of other disease states. Effects can vary to very subtle to severe. At some point, cognitive impairment may limit an elder adult’s ability to make decisions. These limits may be in specific domains, such as financial or medical. Alternatively, cognitive limitations may be more global in nature. Some elder adults had the foresight to record specific beliefs prior to any cognitive disease. Health care proxies, living wills, or financial power of attorney document an individual’s choices at an earlier time point. But many adults do not put their wishes in writing. Also, adults are free to change their opinion at any point. The question must then be asked: at what point does cognitive impairment limit a person’s capacity to make decisions? There is not one simple answer. The level of scrutiny varies with the task. For example, making changes to a will generally only requires a low level understanding of one’s estate and heirs. Other tasks, such as consenting to a complicated medical treatment, will require far more understanding. Thus, the level of scrutiny is much higher. But where should society draw the line between protection and paternalism? These and other issues were addressed by a panel at this year’s Annual Meeting of the American Academy of Psychiatry and the Law (AAPL), which took place in San Diego, California on October 24-27, 2013. The panel, entitled “Impaired Medical Decision-Making in Older Patients,” included a lively discussion between Stephen Read, M.D. of the Department of Psychiatry and Biobehavioral Sciences at UCLA; Debra Pinals, M.D., the Assistant Commissioner of Forensic Services for the Massachusetts Department of Mental Health; Phillip Resnick, M.D., the Director of the Forensic Psychiatry Fellowship at Case Western Reserve; Sherif Soloman, M.D., an Assistant Professor of Psychiatry at Case Western Reserve; and Robert Weinstock, M.D., the Director of the UCLA Forensic Psychiatry Fellowship Program. Dissemination of scientific findings to the public at-large has always been a tricky endeavor. Generally, researchers, for good reason, tend to be overly cautious in reaching conclusions and applying their results to broad, societal issues. The public, however, seeks, and rightly so, to use any method possible to understand the world and eliminate injustices. And so the two, both seemingly operating with the right intentions, may disagree about what is to be done with novel research findings. CLBB’s core mission of prudently translating scientific findings to the public speaks to the heart of this dilemma. 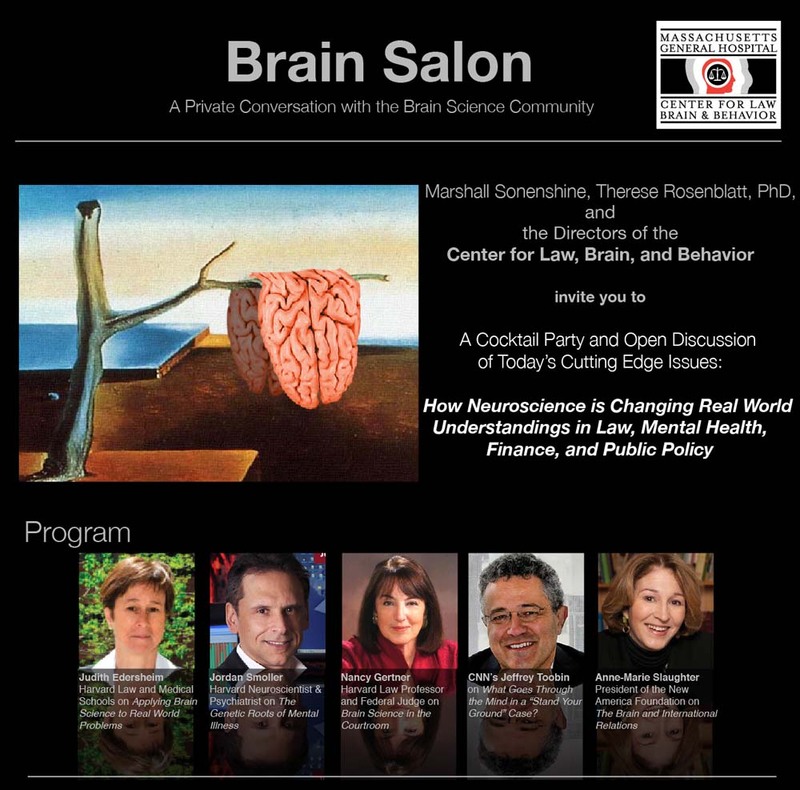 One example of such work was a Brain Salon hosted by CLBB and Marshall Sonenshine and Dr. Therese Rosenblatt on October 30, 2013 in New York. The event entitled, How Neuroscience is Changing Real World Understandings in the Law, Mental Health, Finance, and Public Policy, was chaired by CLBB’s Co-Director Judy Edersheim, J.D., M.D. The panelists were Jordan Smoller, M.D., Sc.D., Director of Psychiatric Genetics Program at Massachusetts General Hospital, Nancy Gertner, J.D., Former Federal Judge and Professor at Harvard Law School, Anne-Marie Slaughter, Ph.D., President and CEO of New America, and Jeffrey Toobin, J.D., author and legal analyst for CNN and the New Yorker. The speakers discussed application of scientific findings to their respective fields and social issues at large. The attendees, luminaries in their own right, in fields of finance, law, entertainment, academia, neuroscience, psychology, and medicine, debated about how to best manage translational of scientific research. As tight-knit Danvers mourns the tragic death of Colleen Ritzer, the 24-year-old math teacher found dead last week near Danvers High School, there’s some concern with what could be another potential tragedy. Ritzer’s accused killer, Philip Chism, a 14-year-old Danvers High student, is being held for murder, and in spite of his age, will be tried as an adult in an adult court. What that means for Chism is not entirely clear given that a Grand Jury has not yet officially indicted him for first- or second-degree murder and that the laws for juveniles are in limbo, but the state’s history of juveniles being tried and sentenced as adults paints a bleak picture for youth. Since 1996, Massachusetts has had a law on the books that’s one of the harshest in the nation, according to the Massachusetts Coalition for Fair Sentencing for Youth. Unlike nearly every other state in the country, Massachusetts requires a trial in the adult criminal court for anyone who is 14 or older and charged with murder. Since Chism has been arraigned as an adult and will be tried in an adult court, there is no mechanism for the current case to be moved into the juvenile court system.